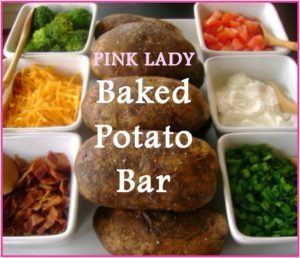 Pink Lady Potato Bar Fundraiser! The Power County Hospital Pink Ladies Auxiliary will be hosting their annual Baked Potato Bar at St. John’s Lutheran Church on Tuesday, February 12, 2019 from 5:00 p.m. to 7:00 p.m. The baked potato bar fundraiser help to raise funds to purchase patient chairs and recliners for the new hospital and nursing home rooms. Donation will be at-will for the meal. Please come and join us and enjoy a wonderful meal and support our local hospital. **Please look for our gift basket raffle display at the dinner. Tickets will be 6 for $5 or $1 per ticket. Raffle winners will be announced at the end of dinner.